Public recycling works. At least that is my unofficial take on the matter. I’m constantly looking in trash and recycling bins. In the past two years, when I’ve come across a public recycling bin and looked in I’m usually pleasantly surprised at the compliance. I find a lot of soda cans and plastic bottles in the bottle/can bins (and a fair amount of coffee cups). Public newspaper bins are pretty good too. 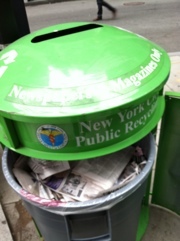 Today in downtown manhattan a green, designated paper bin was open, so I looked in and I saw paper! Lots and lots of it! In the blue bottle and can bin was mainly bottles and cans. People want to do the right thing, and given the opportunity (and sets of bins placed together) they generally will.